I'm not too sure when I bookmarked Aoi but it may have been after I saw Phil's post. 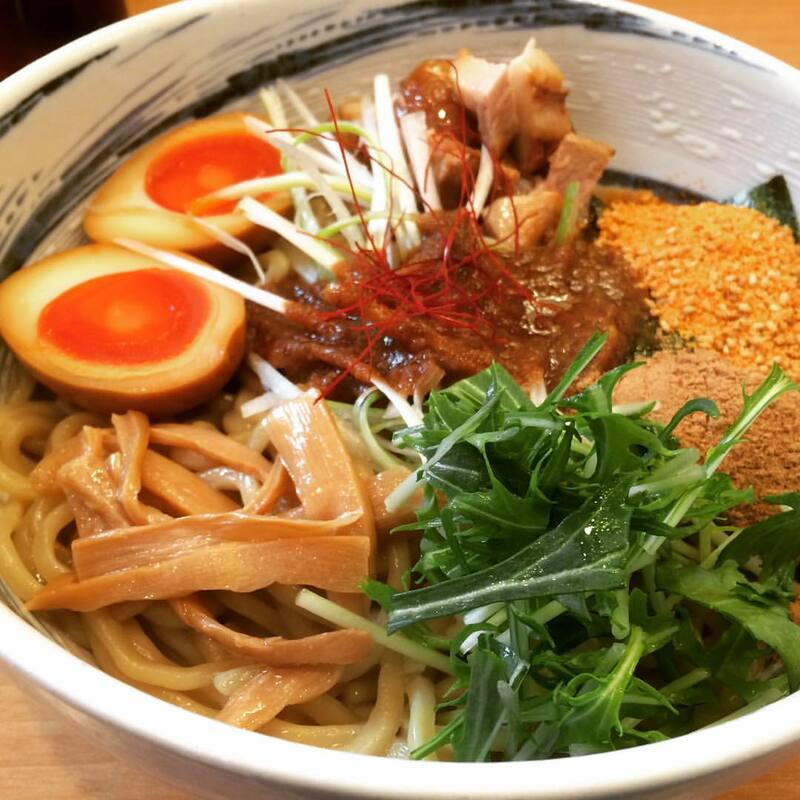 Aoi is a teeny ramen shop nearby (about 7 seats) and if you don't get there early, be prepared to wait. Even then, if they run out of noodles or soup, they are done for the day. This past Saturday, I got Satoshi out and about and we were there a little after they opened at 11:30. 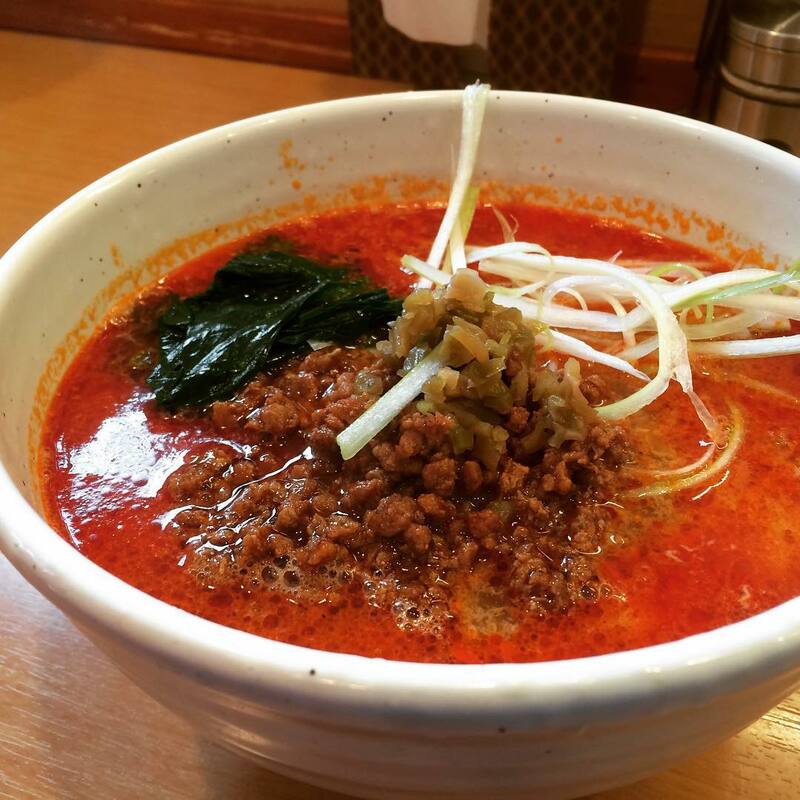 Satoshi went with their tan tan men...800 yen. I think it was quite spicy with their housemade ra-yu (chili oil) because he was perspiring a LOT. Thicker noodles than their ramen, this came with char siu, menma (pickled bamboo shoots), a soft boiled egg, mizuna, a thick shoyu based miso sauce and what I think was fish powder and yuzu sesame powder. Mixed all together this was so good! You can also add some of their housemade ra-yu and/or their housemade vinegar. I really liked their char siu, porky goodness. 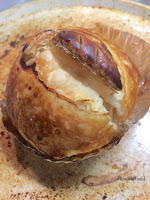 Unfortunately, I had a hard time finishing this so I gave the last bites to Satoshi. He agreed this was good. When we left, there was a line outside of the door as well as a few people waiting inside. I'm amazed at all the different creatures we have in our neighborhood. Of course there are all sorts of different birds (ducks, herons), and we sometimes see a carp swimming around in the river. We also have fireflies during the summer. 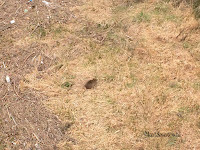 The other day as I was crossing over a footbridge, I noticed what looked like a rabbit feeding on some grasses below near the river. 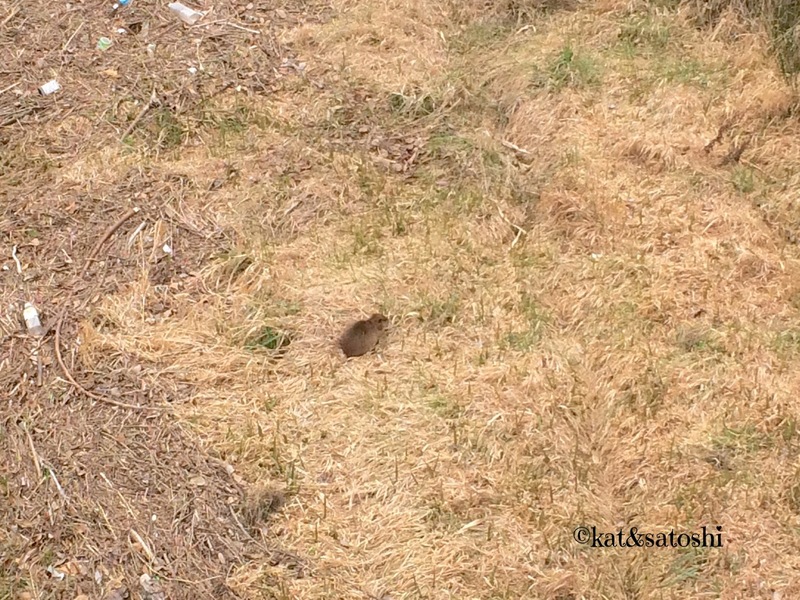 I stopped to look at it because I've never seen a rabbit down near the river. Sorry the picture is teeny but that was as far as my iPhone's lens could zoom in. It was my first time seeing a creature like this and after searching the internet it turns out that it was a nutria. Here's a link on Wikipedia (apparently it is also called coypu), there's even a short video there as well. 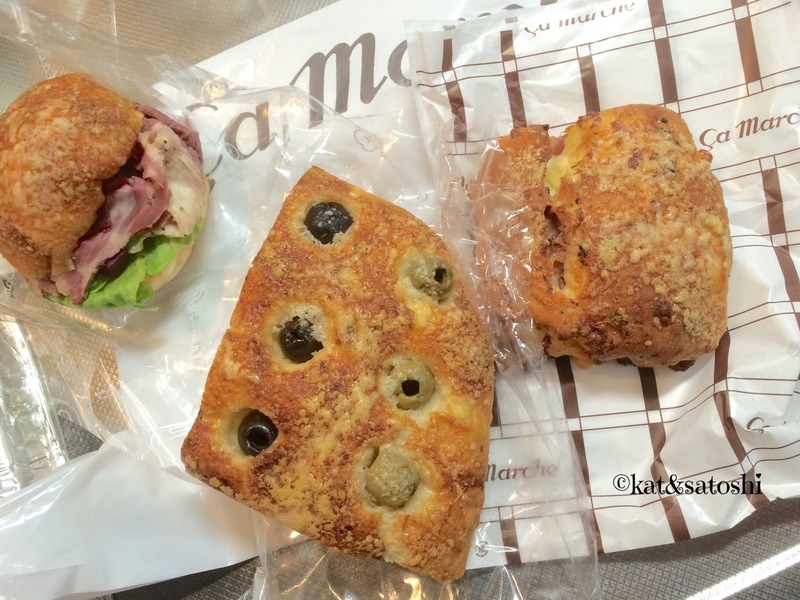 Sunday, we checked out Haconeco-do, a relatively new cafe near the Hankyu Sakurai station. In Japan, there are cat cafes, dog cafes even owl cafes. From what I understand, cat cafes are where the cafe owner's cats are roaming around inside the cafe. Dog cafes are usually cafes that you can bring your dog with you to. 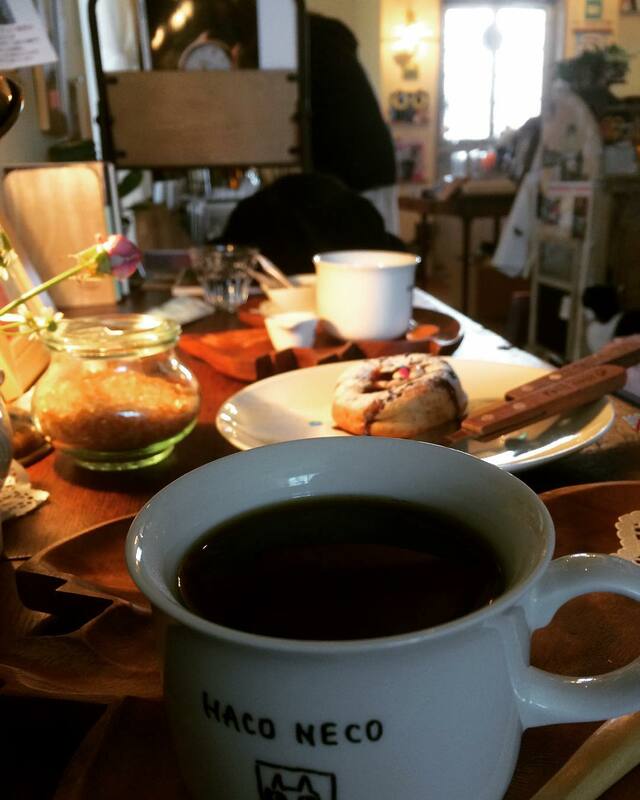 Anyway, we visited Haconeco-do and it is a cat cafe. Dunno that we'll be back soon. A couple of weeks ago, we filled out an enquête (questionnaire in French) for the gas company. To tell you the truth, the form was poorly made and we really didn't know if we answered it properly. 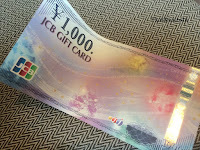 The thing about questionnaires in Japan is that they usually "reward" you for answering them. I asked Satoshi why companies do this and he said that if they didn't reward you, most people wouldn't take the time to fill them out. So the other day, the gas company sent us our "reward"...a gift certificate for 1000 yen, which we used at our neighborhood conveyor belt sushi shop. Do companies usually reward you for answering their questionnaires where you live? When we visited Totsukawa, we picked up a yubeshi. 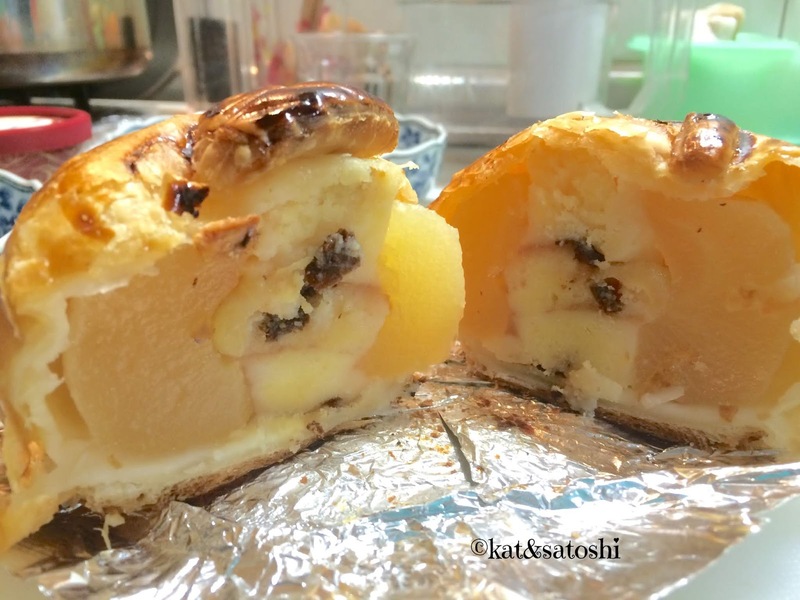 A hollowed out yuzu (citron) that is filled with savories like katsuobushi, sesame seeds, miso. One way that we were served the yubeshi was thinly sliced on top of cheese, so that is one way that we had it at home. Another way that was suggested was as chazuke (with tea and rice). So we tried it this way as well. 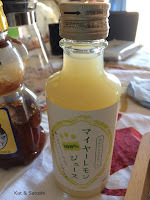 I like the yuzu flavor with the tea. 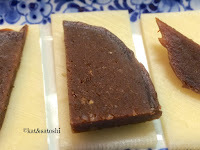 I froze most of this and will take it out every so often for us to have as pupu (appetizer) with cheese. Friday, I stocked up on foods so that we wouldn't have to venture out in the rain. For dinner, I made gyoza. The bottoms came out crisp and the tops were chewy. 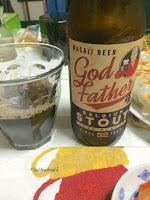 I tried this beer by Minoh Beer called Godfather 4 dedicated to their founder who passed away a couple of years ago. This stout was nice with a hint of yuzu. Thursday, I had a dental appointment. Afterwards, I ran some errands and then snagged the last table at Critters Burgers. This time around I had their BBQ Cheeseburger. The burger was a bit too salty this time around. I'm glad they are still in business though...I'll be back to try their sandwiches. Just around the corner is Streamers Coffee Company...they closed at their previous location back in 2014 and re-opened in their new location the other week. 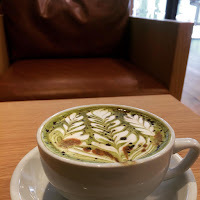 I tried their military latte...I think they call it military because it sort of looks like camouflage. Matcha, white chocolate and espresso...780 yen...it was pricey but the cup was HUGE. Our weather is still krazy, hope you have a nice weekend! It has been ages since I've been to Cafe Copan. This was one of the first places Satoshi and I tried when we moved to this area (pre-blog). After meeting Hiromi-san for lunch, we ducked into Cafe Copan to avoid a mini hail storm. 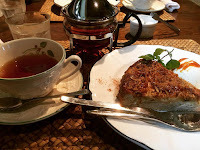 We both had their caramel banana cake with some tea. This was dense and not very sweet. It was nice catching up with Hiromi-san. We'll be back for lunch. Satoshi and I checked out Gosou the other day for lunch. They make their condiments from scratch and stay away from preservatives. 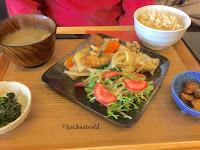 Satoshi had their weekly lunch which was a sweet sour buri (amberjack)...1000 yen. I didn't catch all the different side dishes that his meal came with, but he said he enjoyed this. 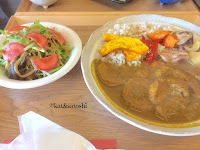 I ordered their 20 spice yakuzen (herbal) curry...900 yen. Dunno what type of spices/herbs were in this but there was a nasty bitter aftertaste, making it very hard to finish. 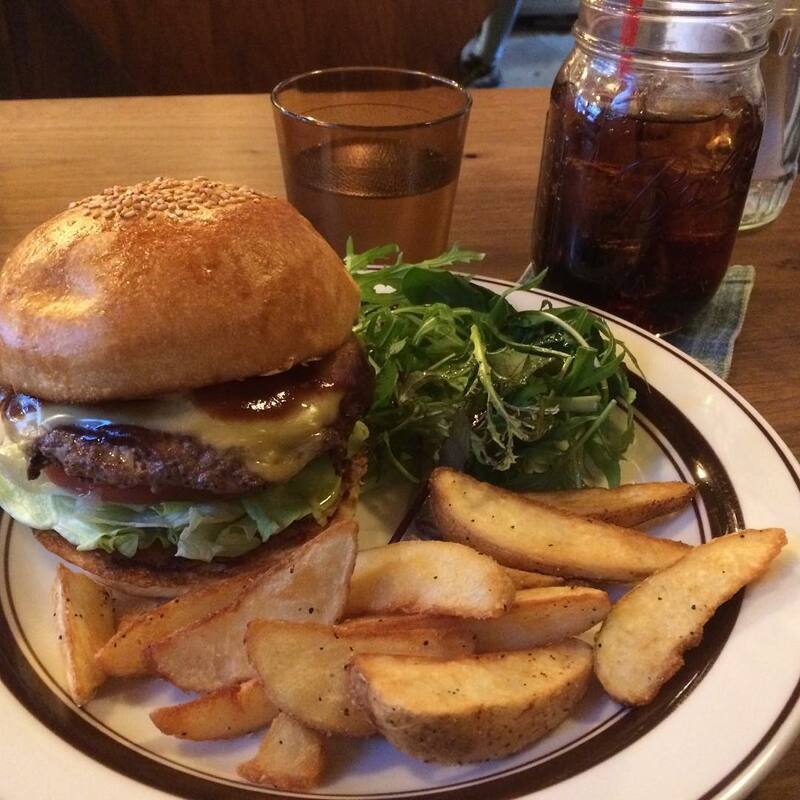 Still, there are other items on their menu that we want to try, so we'll be back. 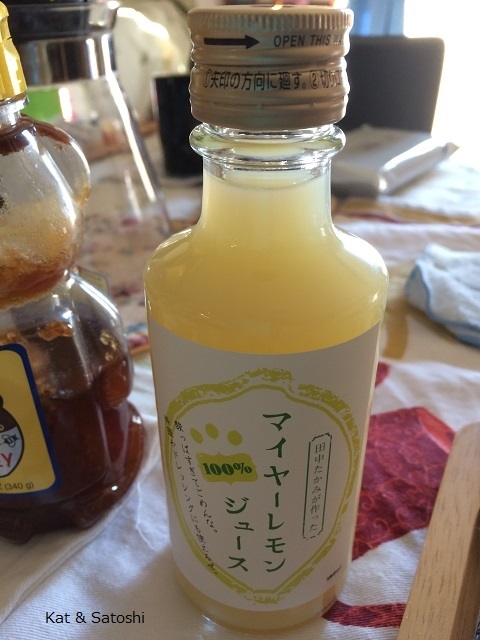 My host brother's wife recently gave me this bottle of meyer lemon juice. I remember many years back when my blog friend Rona asked me to look around online for meyer lemons for her...it is exciting to see food items slowly making their way into our markets here. 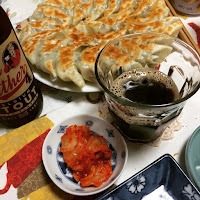 This happens to be from Mie Prefecture. So far, I've used it on sautéed shrimp. This doesn't have preservatives, so I'll have to use it up quickly. Saturday, we checked out Cafe Minatuki. 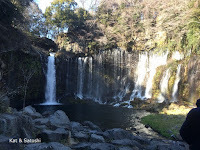 I had been here with my friend, Hiromi. This was my first time trying their lunch. 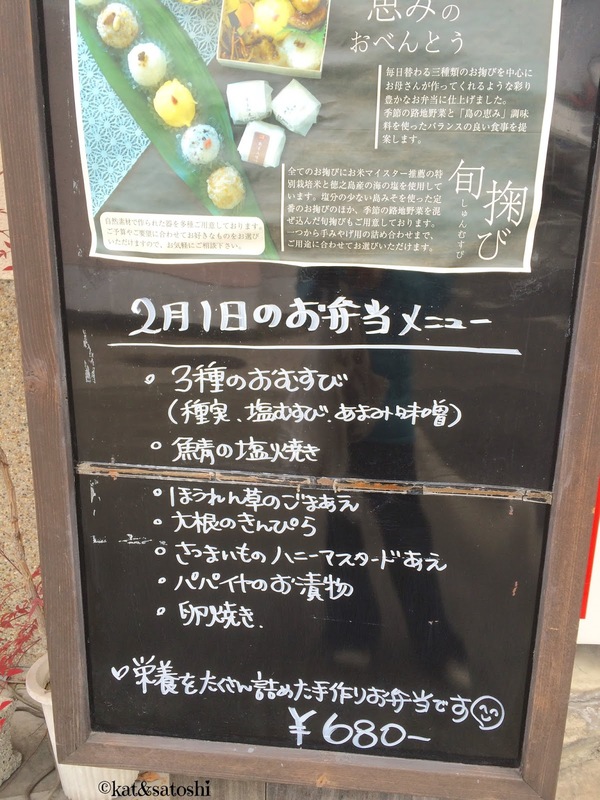 Unfortunately, they don't have many choices on the weekend, just their plate lunch...870 yen (tax included). 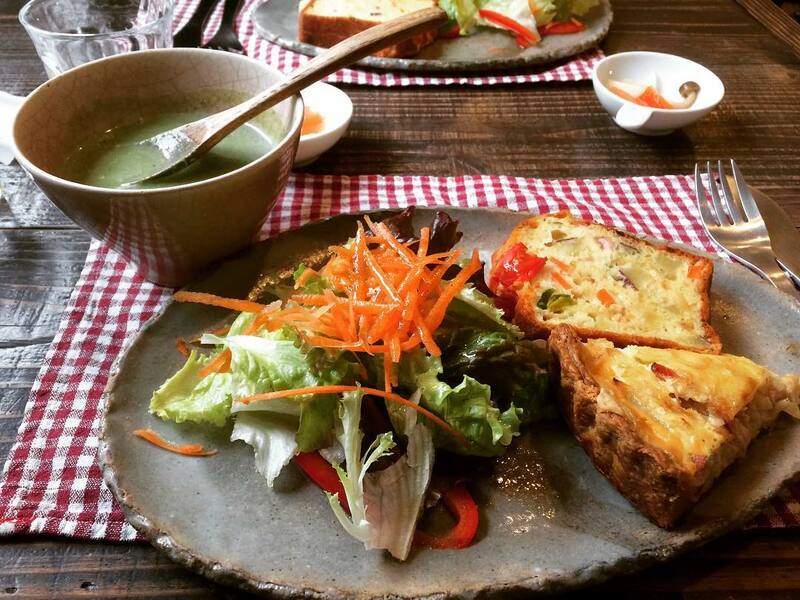 A salad, cake salé (savory type), quiche and a creamy spinach soup. This was perfect for me but too little for Satoshi. After lunch, we checked out their gallery on the 2nd floor. 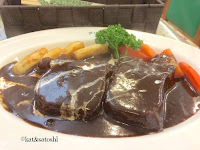 I hope to check out their lunch again during the weekdays. 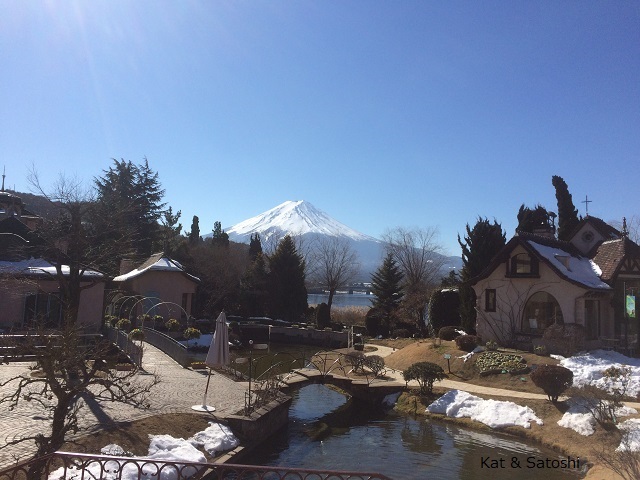 In the past, Salon du Chocolat was staggered from Tokyo, moving on to Kyoto and then to other regions of Japan. This year it was held all at one time and Salon du Chocolat in Osaka was held in the Lucua Hall area...super teeny! I did manage to pick up a 70% dark chocolate bar by Marou. They grow their cacao in Vietnam. The cacao for this bar was grown in Tien Giang. It was quite fruity. 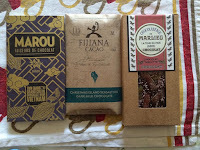 Fijiana Cacao, I found at Sony Plaza. 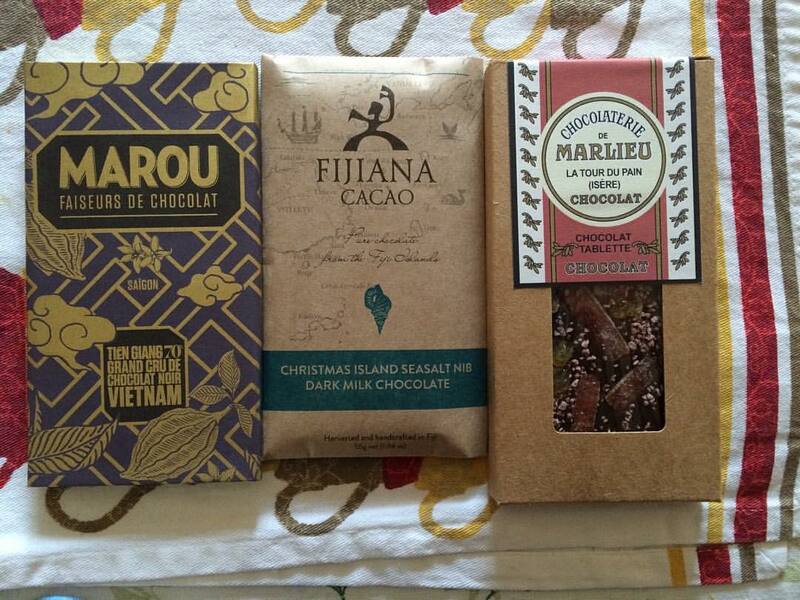 They use cacao grown in Fiji. This particular bar had Christmas Island Sea Salt and nibs. This was a dark milk chocolate and also very fruity. 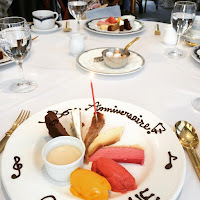 Chocolaterie de Marlieu was another bar I found at Salon du Chocolat, they have been in business since 1906. This tablette was filled with orange peel, raisins and freeze dried raspberries. It wasn't noted, but I think this was a dark chocolate. Overall though, I think the place that had the best assortment of chocolates was Hankyu Department store. 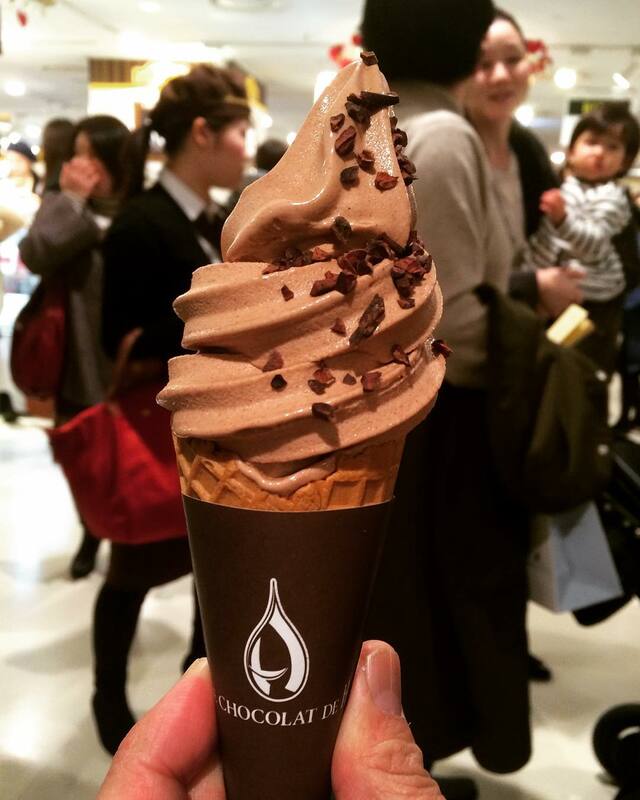 They not only had a whole area for chocolate bars, but they also had areas for soft serve. We tried Le Chocolat de H's ecuador soft serve...delicious with the nibs sprinkled on top. 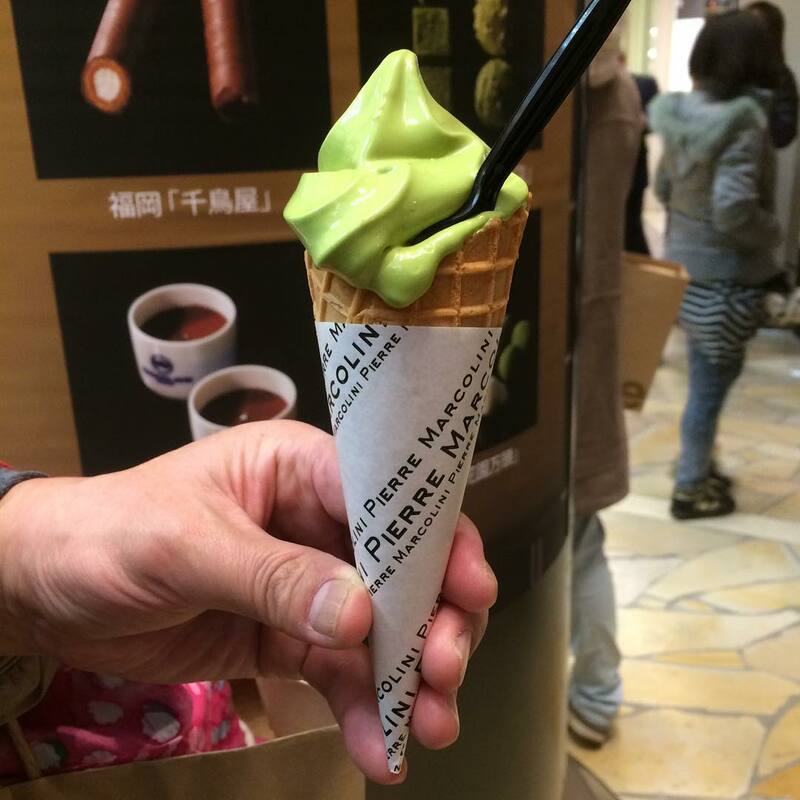 Pierre Marcolini's Blanc Matcha was a bit too soft almost soupy. The matcha was intense though. 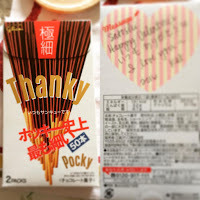 For Valentine's I gave Satoshi these Pocky. They came out with 10 different sayings. 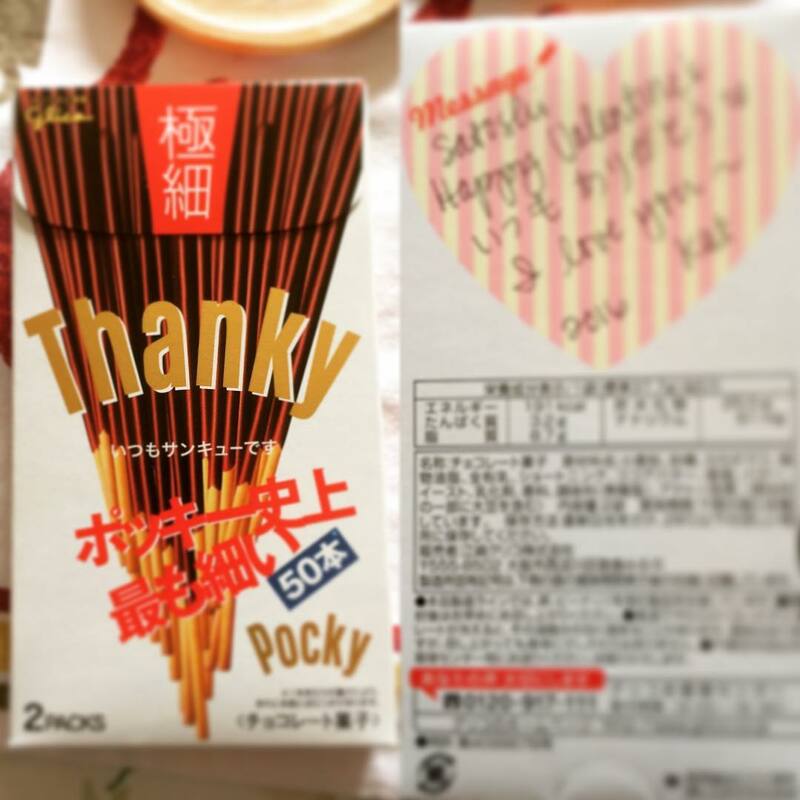 This particular Pocky was super thin and I gave him one that said "thanky"
Hope you had a nice Valentine's. 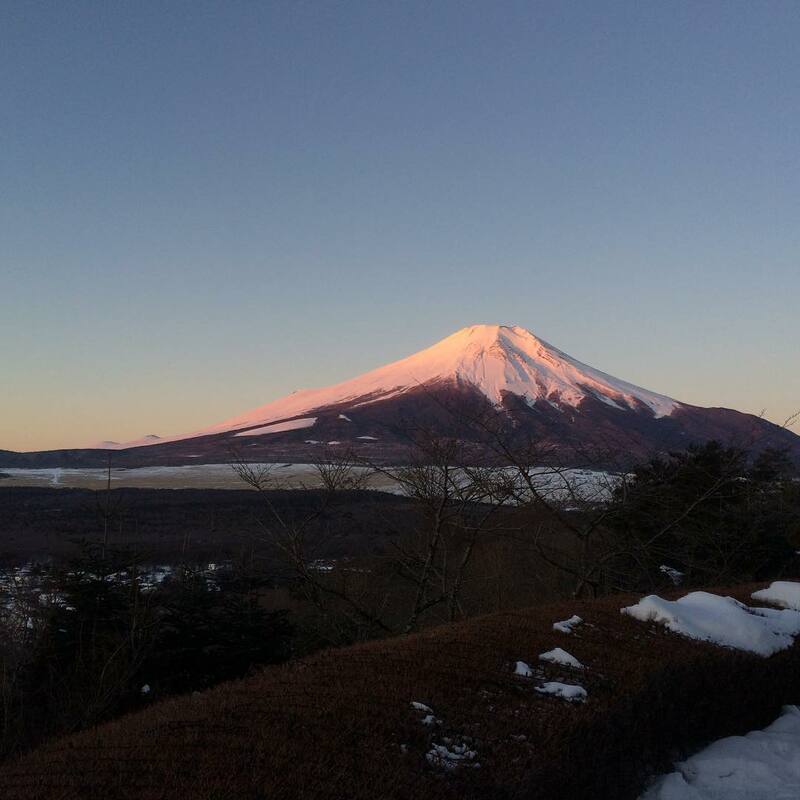 we wanted to catch "beni-fuji", this is when the rising sun casts a light pink (beni) color onto Mount Fuji. It apparently happens 10 minutes or so before the sun rises. Once the sun rises the lighting changes, so you only have a few minutes to snap some pictures. Here's the photo I had posted on Instagram. 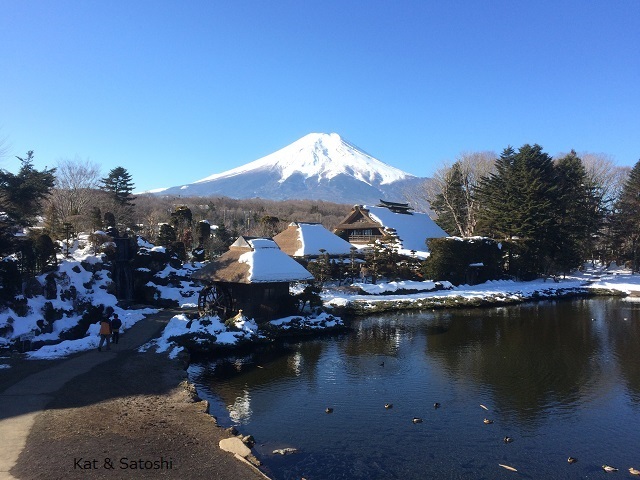 Oshino-Hakkai, is an area made up of 8 fresh water ponds that receives its water from Mount Fuji. Many of the buildings in this area have thatched roof tops. 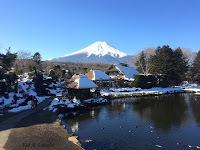 We paid 300 yen admission per person to get into this museum area, it is perfect for taking some photos and definitely worth it. 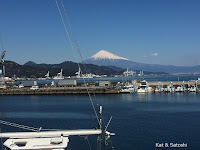 Then we were off to Lake Kawaguchi. 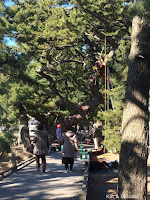 We stopped at Oishi Park. They have a little shop as well as great views. 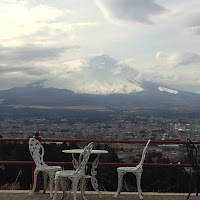 The view of Mount Fuji from the Music Box Museum wasn't too spectacular, but this is where we got to see an amazing "sand art" show, I found a video of a similar performance, here. This is where we also had lunch. 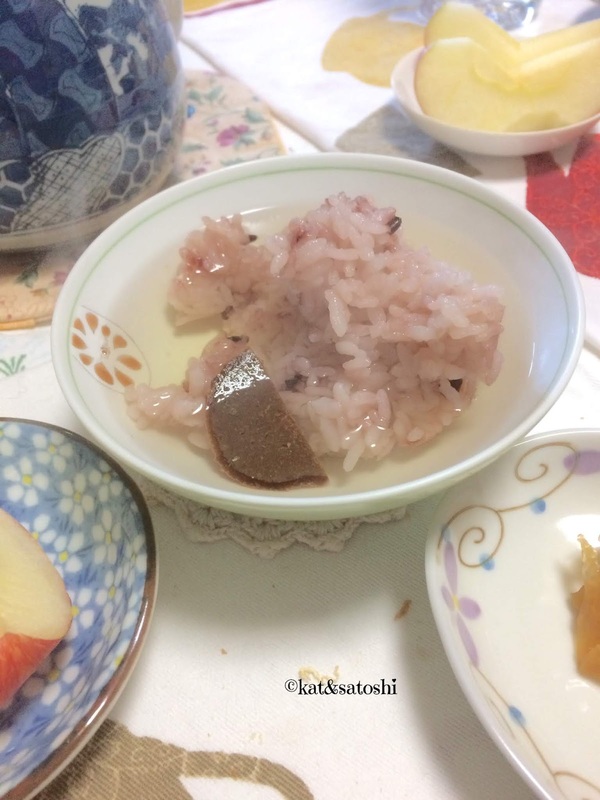 A nice hot bowl of houtou, a regional dish of Yamanashi prefecture. 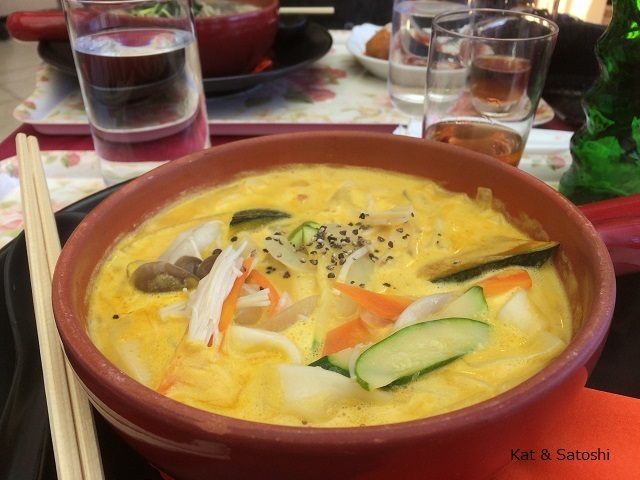 The original version is flat noodles (like fettuccine) cooked with vegetables in a soup of miso. The version I got for lunch was a pumpkin potage. Satoshi had a tan-tan men version...both were different but hit the spot on such a cool day. 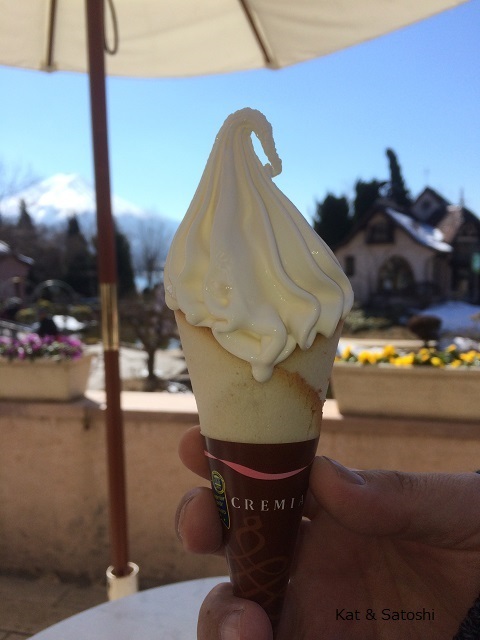 I have been seeing Cremia on various social media sites and even though it was too cold for soft serve, Satoshi and I shared this one (Can you see Mount Fuji in the background?!). This soft serve uses 25% cream and has 12.5% milk fat...super rich! 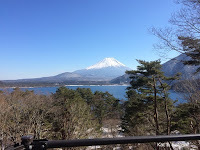 After lunch, we drove along the lake to Lake Sai and Lake Shoji (part of the 5 lakes of Mount Fuji). We also stopped at Lake Motosu. This is the same lake that is apparently printed on the backside of the 1000 yen bill. 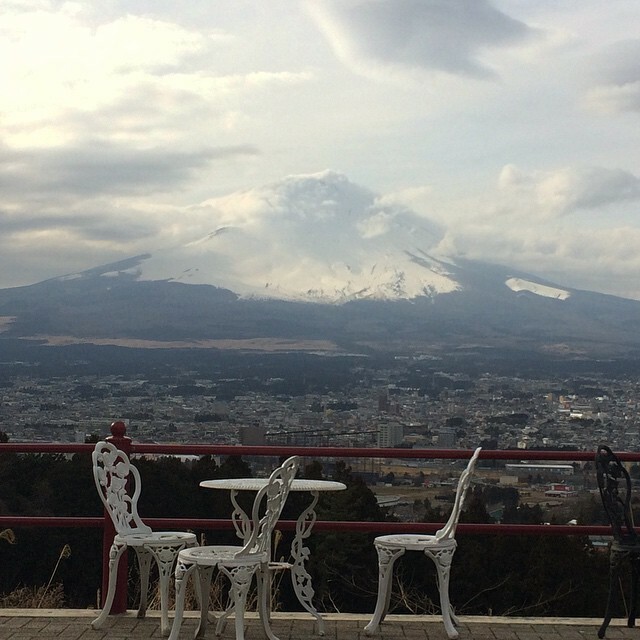 A view from the Asagirikogen Rest Area. And then we hiked down (there were steps all the way down) to see Shiraito Falls. 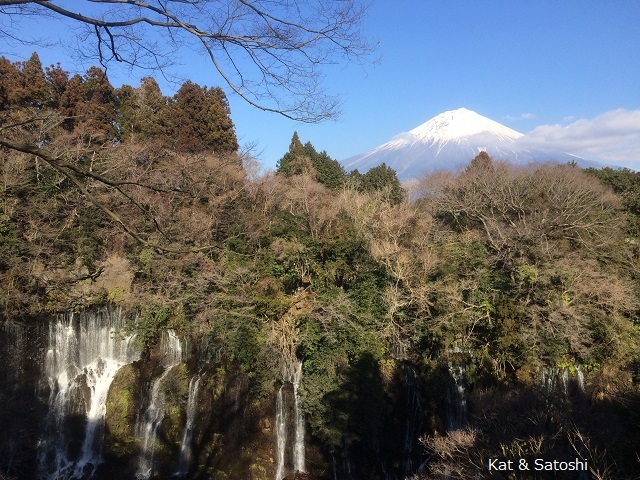 The water is apparently from Mount Fuji. 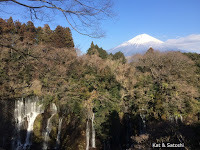 To actually see Mount Fuji with the falls, hike up 90 more meters (295 feet) to the lookout point. 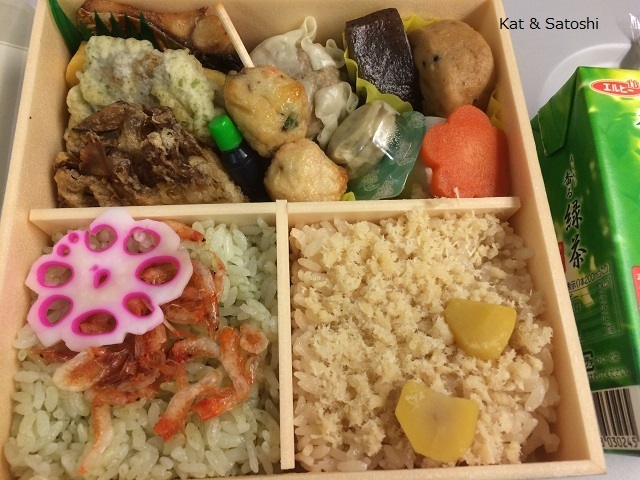 And then it was a bento for dinner on the train ride back to Osaka. Super short trip and we were blessed with good weather. 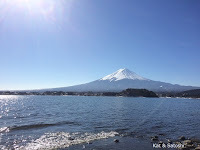 I'm glad we were able to do this again and this time around we were thankful that we got to see Mount Fuji. Hope you enjoyed this trip as much as we did. 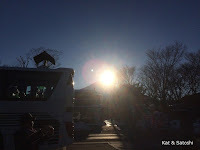 Our tour started at 7:00, we all met at the Shin-Osaka station (where the Shinkansen (bullet train) runs). The tour guide mentioned that there were 43 of us, almost making a full bus load (which I think is 50), I think this tour was popular because there was a holiday the next day. 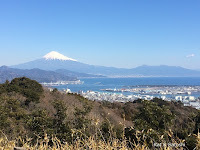 From Osaka we travelled to Shizuoka, which took about 3 hours because we took the slowest Shinkansen (Kodama). 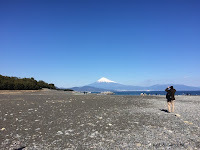 Our first stop was Nihondaira, a plateau from which you can see Mount Fuji, the Pacific Ocean as well as another sightseeing spot, Miho no Matsubara, an 8 kilometer (4.9 mile) stretch of beach that is lined with pine trees. 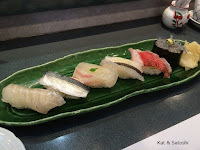 Lunch was at Umi, a small sushi shop inside the S-pulse Dream Plaza, a tiny shopping mall, located at the Shimizu Port. 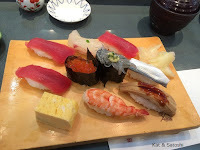 I had the local fish sushi (the sushi chef rattled off the names of the different fish, but it was too quick for me to understand)...still, this was delicious and just the right amount for me...1600 yen (tax not included). Satoshi had the edo-mae sushi 1800 yen (tax not included). After lunch, we walked over to the ferry terminal to take in a view of Mount Fuji. 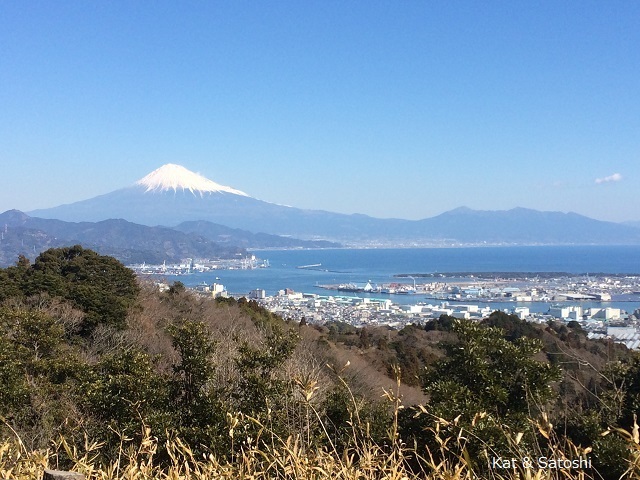 Our next stop was Miho no Matsubara located on the coast of the Miho Peninsula, which is part of Suruga Bay. 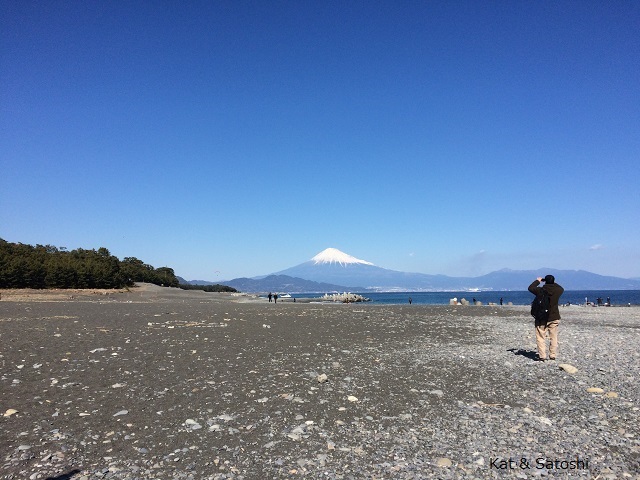 If this beach area looks familiar to some, it is apparently where the opening of Abarenbo Shogun was filmed. 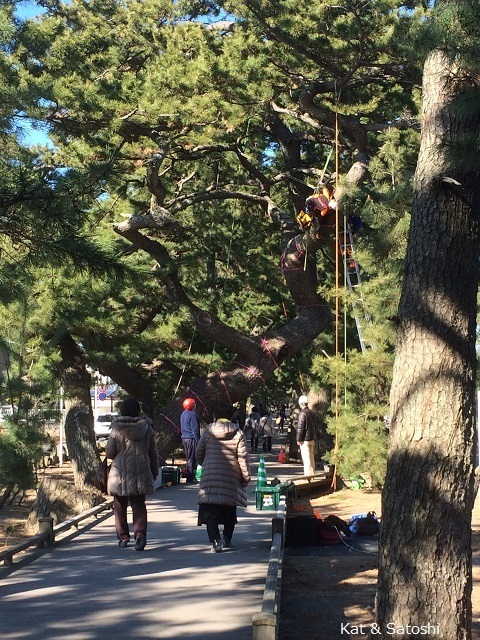 Not only was the view of Mount Fuji beautiful, these pine trees on the walk to the beach were too. I have to tell you that not all 16 spots were those we were able to stop at and get off the bus to take a picture, some spots were seen as we passed by. Our last stop of the day was at Lake Yamanaka. By then, the sun was starting to set (that is Mount Fuji in the glare). I had posted this picture of the sunset on Instagram, as seen from our hotel's garden. We were blessed with great weather (Thanks Grandma, Mom & FIL and everyone that was rooting for us!). Have lots of photos to go through. But will try to post something tomorrow. This photo is what the locals call "beni-fuji" just a tad before sunrise when there is a light pink (beni) coloring on Mount Fuji. 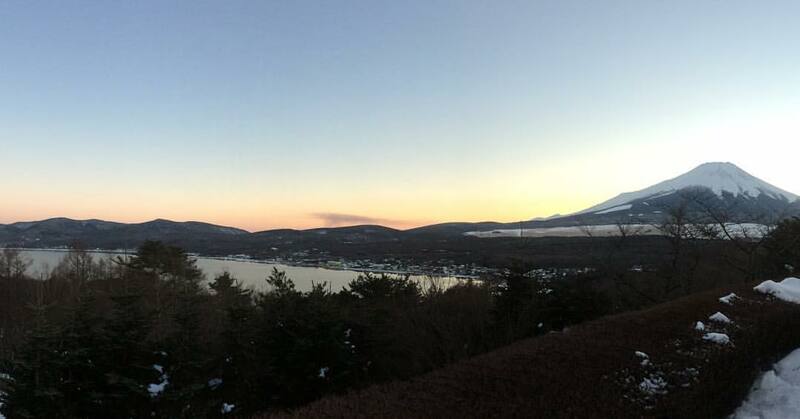 It was fahreezing -6C(21F) but so worth waiting to see it happen. 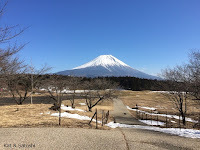 Last year, we went on a tour to see Mount Fuji from 16 different locations, which I kind of wrote about here. The Japanese like to use the word "revenge" to mean that they will "try something again". I think the word "revenge" is very negative, don't you?! 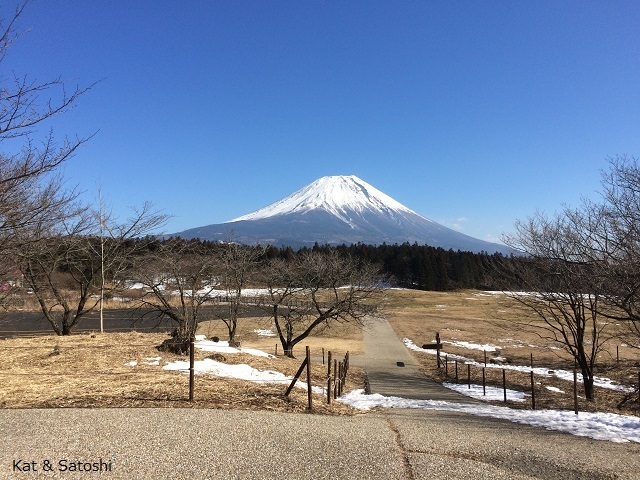 So, we're trying this tour again...cross your fingers that we'll be able to see more of Mount Fuji this time around. Instead of fighting the crowds in Chinatown, we ate at a yoshoku-ya (western style), Grill Ippei. According to their website, they opened their first shop in 1952 in the Shinkaichi area of Kobe. 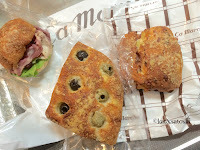 The one we ate at was their Motomachi shop, which is near the East gate of Chinatown. Luckily, we got there soon after they opened and there wasn't a line (yet). 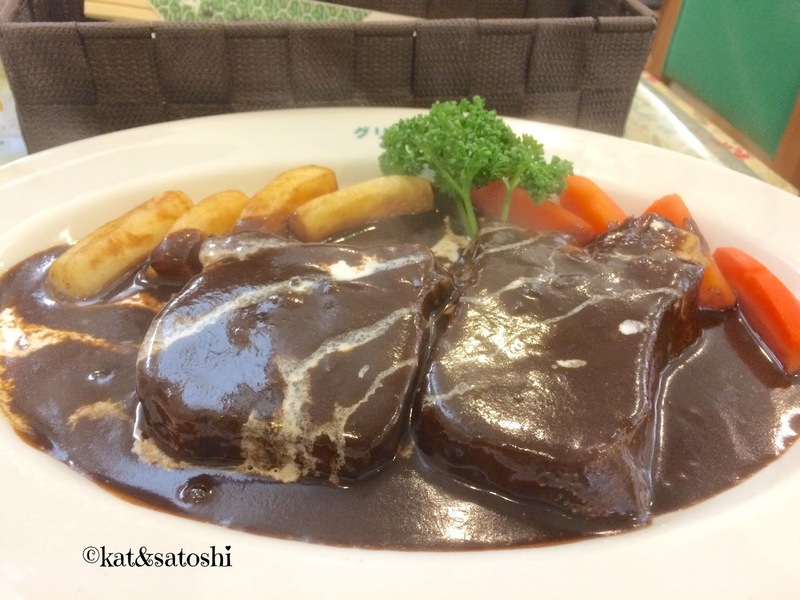 I ordered their tan-stew (beef tongue) simmered until fork tender. At 2200 yen (tax included) this was totally worth it. Satoshi ordered their "C" set 1900 (tax included), his meal came with potage (soup), some salad, fried fish, fried shrimp and pork sauteed with onions and other veggies. His plate also had some potato salad, slices of ham and a little macaroni coated with tomato sauce. (no photo). Everything that other customers were ordering looked good too, we'll be back! 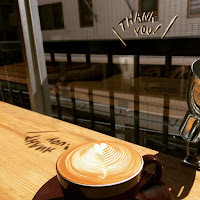 Just around the corner from Grill Ippei is Coffee Labo Frank. Last year, I visited their stand-up coffee shop called Coffee Stand Frank. Since then, they moved to this new address. We liked the laid back feel and their coffee good. I'm not sure how I found about Kissa Maruo, but I have had them bookmarked for some time now. We took this home and heated this up in the oven at home and served it with some vanilla ice cream. The crust was disappointing, really mushy. We liked the apple and custard type filling. I'm glad we got to try this. At Ça Marche, we picked up some items to have with wine and other nibbles. A beet and pastrami sandwich (we got two), some olive bread and a cheese bread filled with 3 cheeses and some bacon. Although the wind was icy, the sun was out and it was a delicious way to celebrate. It's the start of Chinese New Year...the year of the monkey (fire monkey), which apparently occurs every 60 years. 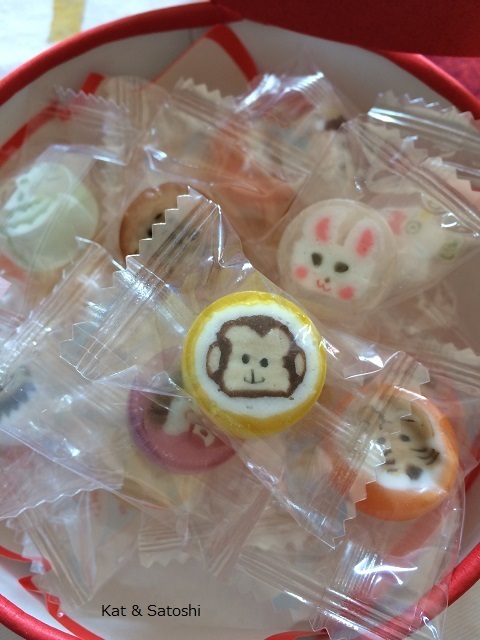 We purchased these cute zodiac candies from Ogurasanso, earlier this year. Not all the animals were recognizable, though. They were still fun to look at and taste good too. Yesterday, I got together with my host mom, host brother's wife and my host sister for lunch. It's been awhile since my host sister has been able to join us. While the food at Genti Osier wasn't too good, the dessert service was nice and it was nice to be able to catch up with everyone over lunch. My host mom and I also celebrated our birthdays early. I've passed Freedom Kitchen several times, just never when they were open. 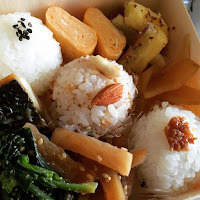 I finally tried their bento...680 yen (tax included). A salted musubi, one with nuts, and a slightly sweet miso musubi. Rolled omelette, honey mustard sweet potato, papaya pickles. 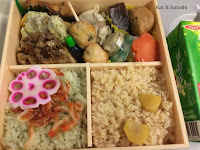 I really enjoyed this bento. Lots of different items. My favorite was the musubi with nuts. Roasted and a little salt, a nice substitution in place of furikake. 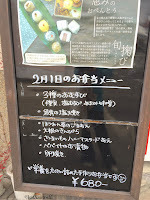 I snapped a picture of the menu so that I would know what I was eating and so that I could blog about it.